People surround St. Isaac's Cathedral on February 12 amid competing protests over transferring the famed St. Petersburg landmark to the Russian Orthodox Church. ST. PETERSBURG, Russia -- Locals in Russia's northern capital who oppose a government plan to hand control of the iconic St. Isaac's Cathedral over to the Russian Orthodox Church have vowed to continue mass protests and other actions. About 1,000 protesters formed a living ring around the massive cathedral on February 12 to protest the decision, which they see as part of the church's strengthening grip over the country's cultural life. "We will carry out other protests as well, although I don't want to get too specific about them now," said protest organizer Aleksei Sergeyev. "We are thinking of erecting a monument 'To The Unknown Offended Believer.' We might ask Gazprom to arrange an eternal flame for us, a little reminder of the eternal flame in which sinners spend eternity. Since they are going after libraries, we might show what they would be like with only spiritual books. We have many ideas." For the second time, the protests have prompted a prominent government official to direct seemingly anti-Semitic remarks at two Jewish St. Petersburg lawmakers, Maksim Reznik and Boris Vishnevsky, who have been leading the protests. 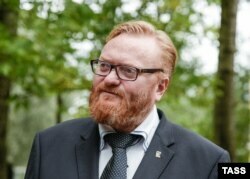 Former St. Petersburg lawmaker and current State Duma Deputy Vitaly Milonov told a small February 12 rally in favor of handing over the cathedral to the church that "Christians survived even when the ancestors of Boris Lazarevich Vishnevsky and Maksim Lvovich Reznik were boiling us in kettles and leaving us to be gnawed to pieces by animals." Vishnevsky responded to Milonov's comment by writing on Facebook that such remarks convince him more and more that the theory that "humans evolved from monkeys" must be true and that some people evolved from monkeys with large brains, while others didn't. Less than a month earlier, Duma deputy speaker Pyotr Tolstoy -- a great-grandson of the renowned 19th-century novelist -- said the two men were "continuing the work" of their forebears, "who destroyed our cathedrals after jumping over from the Pale of Settlement with revolvers in 1917." Tolstoy's remarks echoed an anti-Semitic conspiracy theory suggesting that Jews fomented the 1917 Bolshevik coup, although Tolstoy later denied such an intention. The protests erupted when St. Petersburg Governor Georgy Poltavchenko announced the decision on January 10. The first protest was held on January 28, and more than 200,000 people have a signed on online petition calling for the decision to be rescinded. In Soviet times, the cathedral housed a museum of atheism. Since the collapse of the Soviet Union, it has been run as a museum, a UNESCO world heritage site that attracts about 3.5 million visitors a year. Although there is no sign the government is prepared to back down on handing control of St. Isaac's over to the Orthodox Church, the protests are attracting official attention. Lawmakers from the ruling United Russia and nationalist Liberal-Democratic Party of Russia passed a resolution calling on the authorities to crack down on the protesters. Also on February 1, lawmakers passed a local law banning deputies from holding "public meetings with voters" without the permission of the government -- a move aimed at preventing Reznik and Vishnevsky from protecting the protests. The chairman of the St. Petersburg Legislative Assembly, Vyacheslav Makarov, said he had received dozens of letters from concerned citizens calling for a crackdown. Markarov said "millions" of believers have been offended by the protests' slogan, "The museum belongs to the city." In response, Sergeyev organized a protest at which demonstrators demanded that lawmakers declare the slogan to be "extremist" and proposed transferring control of the legislature to the Orthodox Church and renaming it as the Committee of State Spirituality. The Russian chapter of the International Council of Museums has issued a statement opposing the government's decision. However, the rectors of 23 state-controlled institutions of higher education wrote an open letter to Poltavchenko urging the government to accelerate the handover process so that it could be completed by Orthodox Easter on April 16. The rectors wrote that the protesters are "provocateurs using the matter of St. Isaac's as an excuse to foment tensions in society and sow religious enmity." The purpose of the protests, they claimed, was to "offend the feelings of Christians." Two of the men whose signatures appeared on the letter later told journalists they hadn't signed it. Lawmaker Vishnevsky told RFE/RL's Russian Service that such incidents convince him that the public response to the decision has rattled the government. "I think the matter is still being decided at the highest levels and no decision has been made," Vishnevsky said. "That is why they are now practically hysterical, realizing that they can't suppress the protests or break public opinion." "As for the repressive law banning deputies from meeting with voters, that is unconstitutional because it violates the separation of powers," Vishnevsky said. "It is a legal absurdity that I should have to ask a bureaucrat for permission to talk to the voters. We will take this matter to court." Vishnevsky is incredulous about claims that the slogan "The museum belongs to the city" offends the sensibilities of "millions of believers." "And how does it sound when you hear on the floor of the Legislative Assembly assertions that we are 'Christian soldiers' who are ready to die for our Orthodox faith?" he said. "You have the feeling that you are in some sort of religious school or at a rally before the beginning of a crusade. I can't tell if I am in a 21st-century secular legislature or at a convention of religious fanatics. If that is what they want, let them resign their mandates and go off to a monastery." Tatyana Voltskaya is a correspondent for RFE/RL's Russian Service.